A combination of beautiful landscapes, fascinating culture, friendly people, wonderful weather and a staggering wealth of birdlife make the Indian state of Goa an intriguing birding destination. Naturalist Malcolm Rymer makes several extended birding excursions into the area during the popular tourist season of November through till March, travelling the length and breadth of the region documenting his experiences in two comprehensive travelogues. 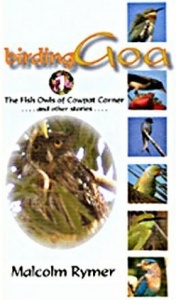 In this first film, The Fish Owls of Cowpat Corner, Malcolm introduces Goa, discusses its avifauna and explores the bird-rich habitats around the popular base of Baga. In the companion film, Flamebacks and Frogmouths, exciting birding continues, discovering a range of different habitats and bird species further afield. The two videos will interest both the newcomer to the Indian sub-continent and also seasoned birders already familiar with Goa.